Friday September 7th 1883 After I got the house cleaned up this morning I did out quite a washing and ironed in the afternoon. We made plum jelly and butter in the afternoon. 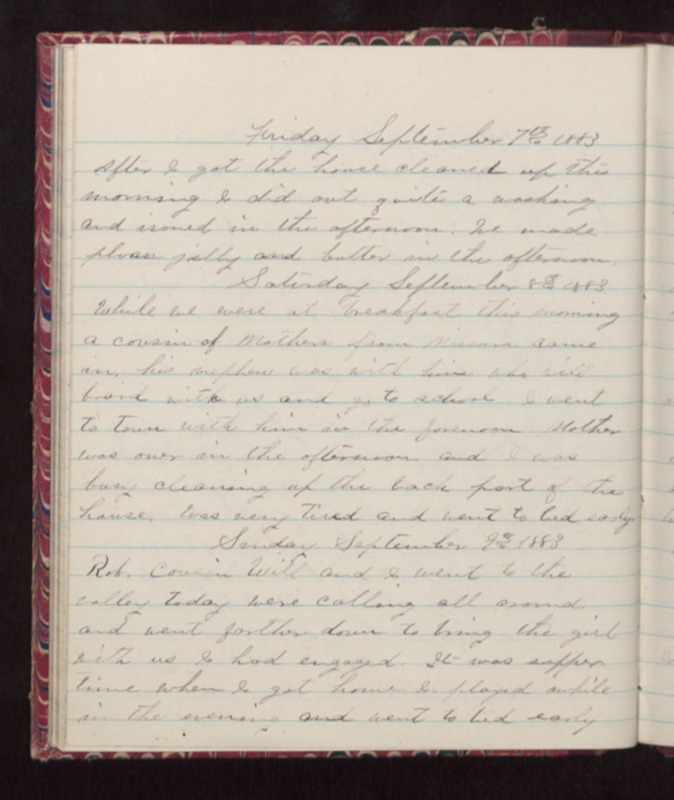 Saturday September 8th 1883 While we were at breakfast this morning a cousin of Mothers from Missoura came in, his nephew was with him who will board with us and go to school I went to town with him in the forenoon. Mother was over in the afternoon and I was busy cleaning up the back part of the house. Was very tired and went to bed early. Sunday September 9th 1883 Rob, Cousin Will and I went to the valley today were calling all around and went farther down to bring the girl with us I had engaged. It was supper time when I got home I played awhile in the evening and went to bed early.